A patient with karyotype 46,XY,der(4) was recognized by standard cytogenetic techniques, and presented with facial features, neurological impairment and pulmonary hypertension. Multiplex ligation-dependent probe amplification (MLPA) demonstrated duplication of the subtelomeric region of chromosome 16p and deletion of the subtelomeric region of chromosome 4q, suggesting a translocation between 4q and 16p. 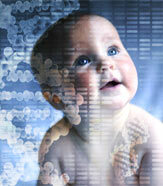 The karyotype of his parents was normal and their MLPA analysis also indicated a de novo imbalance. He had microcephaly, high frontal hairline, thin blond hair, bilateral blepharophimosis and palpebral ptosis, short nose, everted upper lip, cleft palate, micrognathia, cupped anteverted ears, hypoplastic distal phalanges and bilateral inguinal hernia. He also had pulmonary hypertension with tricuspidal regurgitation; cavernous liver hemangioma anomalies have been previously described in association with dup16p. We concluded that pulmonary and other vascular anomalies can be a feature of dup16p. We believe this is the first confirmed case of a 16p subtelomeric duplication with vascular anomalies identified in Albania.